This sensor connects to your home or office internet, and automatically uploads a measurement every ten minutes. You will need to plug it into a power socket. The node is based on Arduino and costs ca. 50 EUR. The hackAIR home v2 is even cheaper and easier to build – check out the tutorial. Make sure you have the following materials and tools available. We here provide links to online retailers, including Aliexpress. Alternatively, visit your local electronics supplier. Advanced users can also assemble the WiFi-Shield themselves using a kit of materials available for EUR 19. The instructions to assemble the shield can be found here. 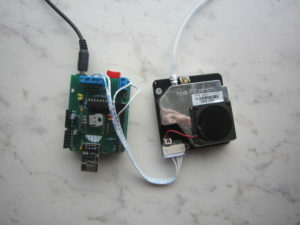 Acquire an access key for your sensor from the hackAIR platform at platform.hackair.eu > Profile > Sensors. The access key is generated after you provide some information about your sensor. If you haven’t done so yet, you need to create a user account on the hackAIR platform first. 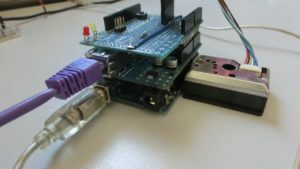 Connect your Arduino to your computer using a USB cable. In the Arduino IDE, navigate to Sketch > Include Library > Add .ZIP library and select the hackAIR library just downloaded. Upload the programme to your sensor node using Sketch > Upload. Disconnect the sensor from your computer and connect it to the power adapter. Connect to the Gadget-XXXXXX Access Point where XXXXXX is the unique ID of your WiFi shield. The password is ‘null’. Provide access to the wireless network: the network name (SSID) and password. Stack the WiFi or Ethernet shield on top of your Arduino and connect your sensor.